The Algebra Help e-book is a hyperlinked electronic textbook on high school and college-level algebra. The topics range from pre-algebra (prime numbers, least common multiples, etc. ), through functions, logarithms, exponents, trigonometry, equations, systems of equations, all the way to complex numbers. To see the entire table of contents right now click on 'Browser version' in the navigation bar to the left. The book is laid out in frames as shown below. The frame on the left can show either the table of contents, the index, the results of a search for any word or phrase in the book, or a list of the bookmarks that you have set. The frame on the right shows the actual text of the book. In the Algebra Coach program, you can press the F1 key after any algebra step. This causes the Algebra Help e-book to open directly at the topic relevant to that step. In the Algebra Help e-book, you can select an exercise problem and drag and drop it into the Algebra Coach's listbox as shown below. The Algebra Coach can then work on that problem. When printed it is about 500 pages long. It contains about 500 exercise problems. It contains about 2000 hyperlinks from one part of the text to another. 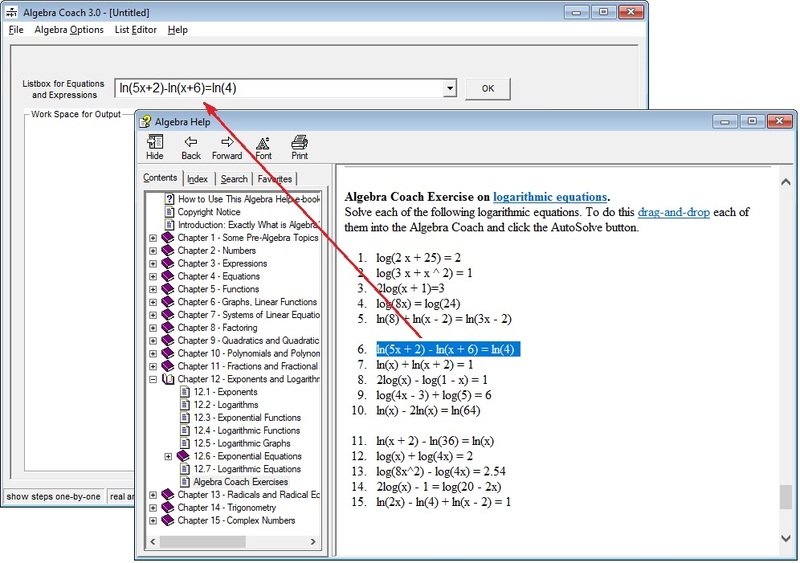 It contains about 300 hyperlinks from the Algebra Coach program to the text. The table of contents is synchronized with the text. This means that if you follow a hyperlink in the text then the table of contents adjusts to show where you have jumped. The index contains about 400 entries. You can search for any word or phrase in the text. You can place any number of bookmarks in the text. Click on 'Download It' in the navigation bar. (The downloaded file is called algebra.chm; the extension chm stands for compiled HTML help file.) Save the file to the desktop or to a folder of your choice. For security purposes downloaded files are often blocked. To unblock the book, right-click on its icon and select properties in the menu. At the bottom of the properties dialog box click on unblock, then on OK. The book is now ready to be read. Double-click on the icon to read the book. 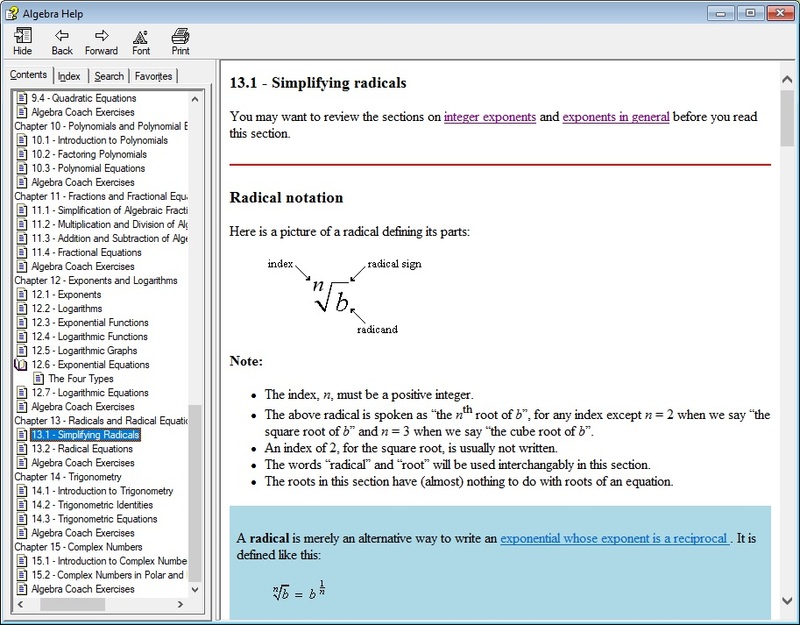 The Algebra Help e-book requires Windows (any version) to run. Note: If you have downloaded the Algebra Coach then you already have the Algebra Help e-book and don't need to download it here.